Looking to make a saving? Then Thursday is the day for you!! 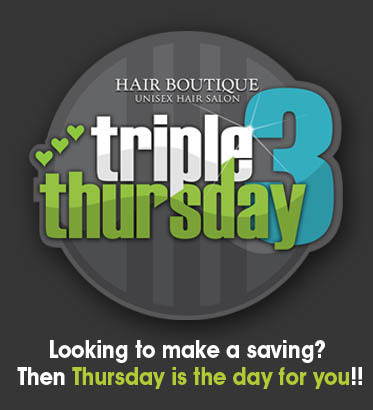 Three family members to book their hair appointments on thesame Thursday, the lowest priced bill receives 50% discount. Ask for a standby appointment slot which are available for all services taken on a Thursday if we have availability within the next hour. Book in with our apprentice to take advantage of budget prices... Once a week on a Thursday we hold a training session. All services are carried out at low cost prices by our apprentice, full supervision is given by a qualified assessor. T&C's and availabilty applies - call us now for me details!